A Jones fracture, also known as a fifth metatarsal fracture, is a foot injury involving the fifth metatarsal, the long bone extending along the outside of the foot which connects to the small toe. This fracture is very common in athletes and can be caused by overuse or stress to this area of the mid foot. The Jones fracture can be mistaken for a simple ankle sprain, but in fact, it is much more serious. It is important to understand the implications of this injury, so read on to learn the following about a Jones fracture:. The Basics – What is a Jones Fracture? The Jones fracture is a fracture of the fifth metatarsal and occurs at the base of this bone (portion closest to the ankle). 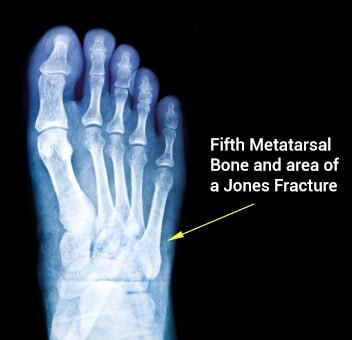 While there are other types of injuries that occur on the fifth metatarsal, such as the avulsion fracture (also known as a Pseudo-Jones or Dancer’s fracture), these tend to be less severe in nature than the Jones fracture. The break associated with the Jones fracture occurs where the base of the bone connects to the shaft. It is prone to stress and receives less blood flow than other areas of the midfoot, both of which can cause difficulties in the healing process. Jones fractures are caused by overuse and repetitive stress or trauma. Overuse and stress on the fifth metatarsal results in a hairline fracture that develops over time. This can be caused merely by walking, jumping, or running, and is often more noticeable in a patient with a high arch. Sudden trauma (an acute injury) to the foot, such as a turned ankle or another inward twisting of the foot, can also cause a Jones fracture. 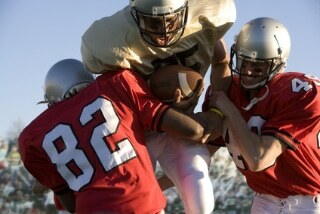 Jones fractures frequently affect professional athletes. You might be familiar with the infamous injuries of Kevin Durant & Pau Gasol of the NBA and Dez Bryant of the NFL.. It is essential to adhere to the non-weight bearing timeline prescribed by your doctor. In addition, it is often recommended that the patient not resume normal activity until a post-surgery x-ray is complete. Finally, a period of physical therapy may be required to help you improve walking functions and learn ways to put proper stress on the healing bone. To learn more about the iWALK2.0, click here. Is it just an ankle sprain? Jones fractures are sometimes mistaken as an ankle sprain, but can be much more severe. If rest, ice, and elevation do not alleviate the pain in your foot after a few days and you suspect that you are suffering from a Jones fracture, you should seek medical attention right away. As mentioned, the area of the Jones fracture has a small blood supply, and the fracture further disrupts that supply, preventing proper healing to take place. Seeing a doctor early on will determine if you have a Jones fracture, the severity of the break, and will put you on the road to recovery much quicker. The fracture can worsen if not treated appropriately, especially if the fracture is due to stress or overuse. 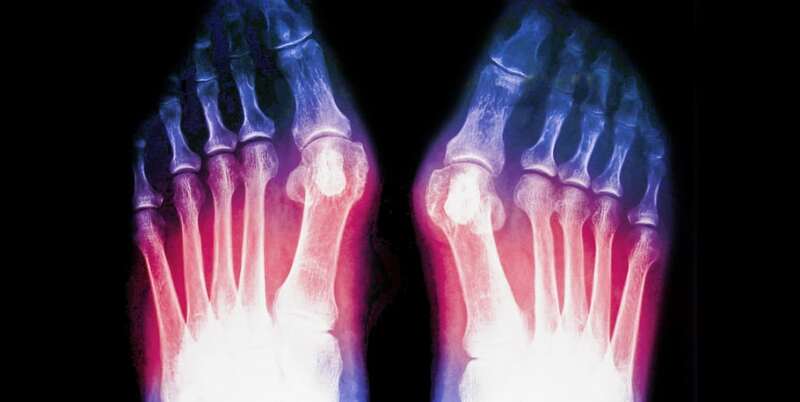 If your doctor suspects a fracture to the 5th metatarsal, he/she will examine the foot, trying to determine the exact source and location of the pain, and will likely order an x-ray. Rest, Ice, Compression, and Elevation — With many foot injuries, it is very important to initiate rest, ice, compression and elevation (R.I.C.E.) immediately. While this initial treatment can be time-consuming, staying off the injured foot, icing it multiple times a day, wrapping the foot, and elevating the foot help to reduce swelling and increase blood flow to the area. This initial treatment will accelerate the body’s natural healing process. Immobilization – a Jones fracture can heal if it is protected from weight bearing activities for a long period of time. A protective boot, cast, or stiff soled shoe may be suggested to support the foot and divert pressure from the area of the fracture. However, to be truly non-weight bearing, it is important to utilize crutches or a crutch alternative such as a knee scooter or hands free crutch. Generally, a minor fracture will take 6 – 8 weeks to heal. Anti-inflammatory Medication – A doctor may prescribe non-steroidal anti-inflammatory drugs to help reduce pain and swelling while the fracture heals. Jones fractures can recur and take significant time to heal. If this is the case, then surgery may be required. Surgery to heal a Jones fracture can be recommended for many reasons. Poor blood supply to this area of the midfoot, a high likelihood of re-injury, and the severity and cause of the fracture are all taken into account when surgery is suggested. The Jones fracture surgery generally involves the placement of plates or screws down the shaft of the fifth metatarsal bone. Placing a screw in the foot holds the bone in place immediately. Bone grafts are sometimes necessary with more severe fractures but are not the most likely course during Jones fracture surgery. The healing time from surgery is typically between 6 and 8 weeks. 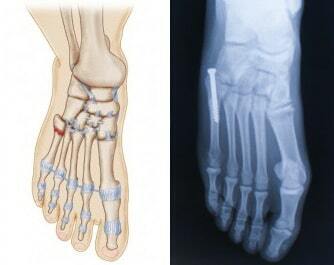 However, some athletes have been known to return to full activity within 2 to 4 weeks after a Jones fracture surgery. With any foot injury, regardless of whether Jones fracture surgery has taken place, it is important to take recovery very seriously. With both surgical and non-surgical Jones fracture treatments, the recovery period is significant (both are generally 6 to 8 weeks), and doctor’s orders should be strictly followed. After surgery, the doctor will usually put the foot in a cast or boot to immobilize the foot. Recovery for both methods of treatment will include a period of non-weight bearing activity when absolutely no weight can be put on the foot. Crutches will enable the patient to keep weight off the foot, but some find them to be cumbersome or even dangerous. If you have an active lifestyle..
You may want to look into crutch alternatives such as a knee scooter or iWALK2.0. While both devices elevate the foot and allow non-weight bearing activity, the iWALK2.0 is the only hands-free crutch alternative that enables the patient to perform day-to-day tasks while utilizing their hands and arms. It is very important that you seek a method that works best for you given your individual situation. Following non-weight bearing, orders are often the most difficult but most beneficial step to a full recovery. Jones fractures, whether caused by overuse, stress, or acute reasons, are painful and require significant recovery time, regardless of surgical or non-surgical treatment. Consulting a physician soon after realizing that a Jones fracture may be the cause of pain in the mid foot is extremely important and will speed overall recovery. In addition, adhering to the physician’s recommendations, regardless of their impact on your day-to-day life, is essential to the healing process and full recovery from a Jones fracture surgery. Advancements in non-weight bearing devices, such as the iWALK2.0, can help you manage your overall recovery process and may help to eliminate the risk of an injury reoccurrence. Do you hate crutches? Learn more or buy the revolutionary iWALK2.0 hands free crutch.